Containers shall not to be moved once deposited by Leewood Skip Hire. 1. (a) That the waste material is of such nature that the regulations issued by the Secretary of State under the Deposit of Poisonous Waste Act 1972 (hereinaftercalled the "Act") in force on the date of the removal of each loaded container exempt the waste material being removed from the provisions of the Act. (b) that the required notice has been served under the provisions of Section 3 (1) of the Act on the required Authorities in the form required by Section 3 (2) of the Act covering the removal of each loaded container. 2. Customers warrant that with respect to each container ordered to be placed other than on private property the permission of the Highways Authority has been duly obtained under Section 31 of the Highways Act 1971, and Customers undertake that they will ensure that all conditions subject to which the aforesaid permission is granted shall be observed at all times in particular will secure that the container will be properly lighted during the hours of darkness. The company will both be liable for any penalties or other liabilities arising as a result of the failure of the customer to comply with Section 31 of the Highway Act 1971. The company reserve the right to request supporting documentation from the customer relating to compliance with Council road permits and suspended bay authorisations. Responsibility for maintaining validity of said permits and authorisations and of keeping the company updated remain with the customer at all times. 3. Customers requesting or ordering vehicles delivering or collecting containers to leave the Public Highway must accept full responsibility for claims, damages or expenses we may thereby sustain whether as a result of damage to the vehicles themselves or containers or the property of customers or third parties or any personal injuries to the customers or third parties and will indemnify us against all claims, demands and costs howsoever arising. 4. Customers shall reimburse us in respect of any loss or damage to the containers whilst on hire to them from whatsoever cause the same may arise (fair wear and tear). They shall also fully indemnify us in respect of any claims for injury to persons or property arising out of the use of the containers whilst on hire to them howsoever the same may be caused or arise. 5. In addition customers undertaking to observe at all times the conditions subject to which the permission of the Highways Authority is aforesaid (including in particular the provision of lamps and traffic cones) if containers are sited anywhere else where they are likely to be a contributory cause of damage or injury to third parties during the hours of darkness, customers provide adequate warning lights on the containers and they shall ensure the safe loading of materials into the containers. 6. 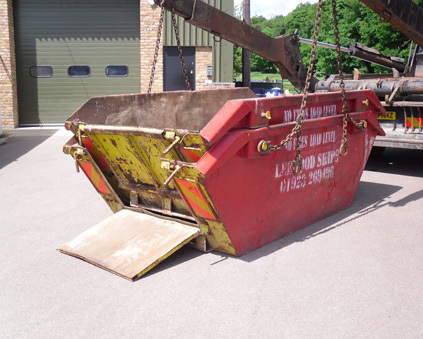 Skips are hired for 14 days, unless agreed otherwise. 7. Should the company become aware that customers have our containers and are not in compliance with the above terms and conditions of hire, we reserve the right to remove the container immediately without notice.